At the ripe age of 18, I decided to get this Ghandi quote tattooed on the side of my ribs. They say that nothing is permanent but I think this comes pretty close! I have always loved this quote. It inspires me to live true to my values and reminds me to always strive to create positive change in the world. It wasn’t until I commenced my Yoga Teacher Training [YTT] with Awakened Spirit Yoga that I really understood what it meant to embody this wisdom. I had embarked on this journey expecting to deepen my practice so that I can support others to discover the benefits of Yoga. Yet what I learnt and experienced over the four week program progressed above and beyond my initial expectations. Yoga is not only about how you show up on your mat. It’s not about how flexible you are, how long you meditate for or how many yoga classes you attend. It’s about how you LIVE your Yoga. How you show up off the mat. How you integrate and weave the teachings and wisdom of Yoga into your everyday life. How you live in harmony with yourself, others, Mother Earth and Source. What really resonated with me about this particular YTT, is how the teachings of Yoga and Permaculture were merged. After living and working on an organic farm for a year and hiking in my spare time, I was excited to explore how two of my greatest passions could weave together. I was surprised by how well the philosophies of Yoga and Permaculture complemented one another in a way that made so much sense to me. Both emphasising the importance of seeking harmony and balance for not only ourselves, but for our collective environment. For me, it truly reflected a holistic approach to being and living. 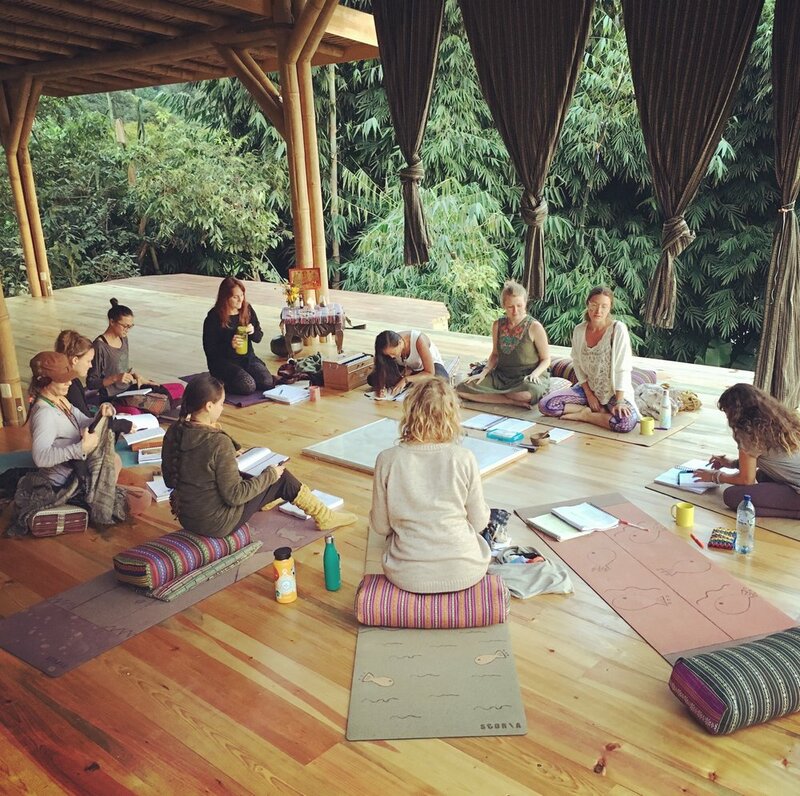 This YTT not only deepened my understanding of Yoga and sacred ecology, it provided me with the tools and the confidence within myself to put what I was learning into practice. The Community Leadership aspect of the training helped me see my own strengths, gifts, and what was holding me back from creating and inspiring change within myself and my community. It took me on a journey to discover how embodying holistic and sustainable practices can radically shift the way I live and engage in the world. I have just returned home to Australia ready to begin the next chapter of my life. I released many of my self-limiting beliefs and re-wrote the ‘stories’ that had been holding me back from listening to the calling of my soul. Awakened Spirit Yoga’s Sacred Earth YTT showed me the door to accessing my potential. It did not unlock the door or push me through. Instead, it showed me that I have everything I need, within myself. Through this door, a world of possibility awaits and on the other side I can create anything I want as I now have the self-belief to move forward and pursue my passion and purpose. I have the foundation to authentically “be the change I wish to see in the world”. I will be sharing more of what I learnt through this YTT in blogs to come. However in the meantime, if you’re interested in learning more about ASY and their trainings, head over to their YTT + PDC Training in Guatemala info page or contact me to find out how you can receive $222 off your tuition if you reserve your spot before March 31st.